Ordering meals could not be easier. If you're ordering for a relative or friend please also pass on your daily contact numbers. Please Place all orders with at least 24 hours notice. We can provide a 7 meal a week service. 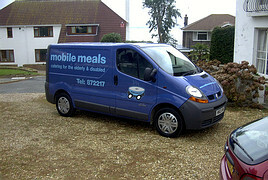 We can also serve meals when delivered on request at no extra charge. We ask for a minimum order of 4 meals per person in any one week. If you're ordering 4 meals or more a week , on a regular basis, then please place your order on a Friday morning (midday latest). Either by phone , or via our website using our Contact page. If you place an order via our website you will receive a confirmation email shortly after doing so. Meals and teas are delivered over a lunch time period. Payment will be required on or before the first day of delivery. As well as cash and cheques you can also set up a Standing order or bank transfer. Just ask for our bank details when placing your order. Please check area/availability when making your enquiry. Many thanks.